As an employer, how can you make sure an intern is happy and your business benefits? Taking on interns can be beneficial to all types of businesses, but it is only recently that small to medium-sized Irish businesses have started to hire interns in any great numbers. The role and value of interns in the workplace have been thrust into the Irish limelight with the introduction of the JobBridge scheme. Introduced in 2011, this national internship scheme aims to match employers in need of additional help with trainees who want to learn new skills. Trainees receive €50 per week from the government on top of their unemployment benefit, and internships last for six or nine months. However, it is important to remember that JobBridge is not the only mechanism through which businesses can hire interns. You are able to take an intern on independently, or as part of another government scheme such as First Steps. Many third level institutes also have programmes that place students with employers as interns. All interns in Ireland have basic employment rights, including the right to a safe working environment, data protection rights, protection against discrimination, break allowances and holidays, and the ability to join a union. Eligibility for the national minimum wage depends on the internship itself, and the organisation offering it. Provided an intern is doing work of value, with a similar level of responsibility and supervision as other employees, then it is likely they will be entitled to the national minimum wage. Certain internship schemes such as JobBridge provide definitive payment, regardless of the nature of the internship. If you are planning on using JobBridge to take on an intern, remember that for this scheme, interns are entitled to public holiday leave, as well as 1.75 days of annual leave per month during the internship. The maximum cumulative sick leave allowed is ten days during the internship. The internship may be suspended for maternity leave, but eligibility must be confirmed again when the intern returns after leave. Your business may receive an incentive for taking on an intern. You or the intern can terminate the JobBridge internship early, but one week’s notice must be given. A good option for employers is to source interns from one of the country’s third level institutions. For example, Dublin City University (DCU) has an internship programme called INTRA , which pairs students with the right businesses for certain times of the year. There is no work permit required for international students and insurance is covered by the university’s public liability policy. 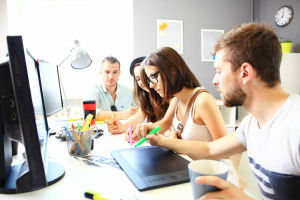 Internships are organised by sector, including computers, engineering and aviation; science and mathematics; business and journalism; marketing and psychology; and administration. UCD Dublin also provides an extensive internship programme for employers, offering interns to businesses for periods from four to 34 weeks. The internships are offered throughout the year, but the majority take place during the summer months. The internships vary by department, and take in the agricultural, business, legal, engineering, architectural, health and science sectors. Many universities offer an internship programme of some sort. Check with your nearest higher level institution to see if they have an internship programme that suits your business. Don’t give interns the “drudge” Remember that most interns want an internship to be a bridge to a new career or an opportunity to get valuable experience on their CV. They can add value to your business, given the right opportunity. Understand the risk. Don’t assume that just because an intern is an inexpensive resource and willing to work that there won’t be teething problems. Get to know your intern’s strengths, and play to them. Embrace different skillsets. An intern in your company doesn’t have to be an aspiring expert in your field. For example, a delivery company could get great value out of hiring an intern with marketing or design experience. Provide induction. Make sure you and your employees are happy to walk your intern through their role, and that there is always someone on hand to offer help if needs be. By offering induction and support to your intern, you will increase your chances of getting maximum value. Don’t limit intern work to tasks. Instead of asking your intern to do different tasks, challenge them by asking them to consider a project with a larger scope. Perhaps a series of tasks could become a mini-project for them to manage. Listen to what they have to say, as you never know what fresh ideas could be on the table. Ensure interns add value to your business. Don’t just take on an intern just because they are available through JobBridge. Recruit them because they can be a flexible way to add value to your business and could represent new talent. Put time into the recruitment process. Define the role, conduct interviews, and ensure you select the right candidate. Good recruitment processes pay off as much for interns as for permanent staff. Treat your interns with respect. Internships are a two-way street, providing both you and the intern with much-needed resources. Remember that when you take one on.